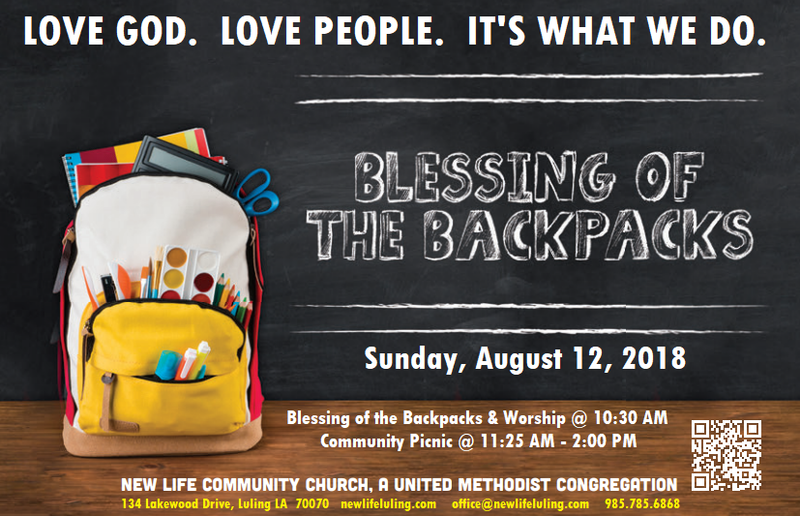 Blessing of the backpacks & back to school picnic! Let us help you prepare for the new school year with prayers for blessings of love, joy, and peace! 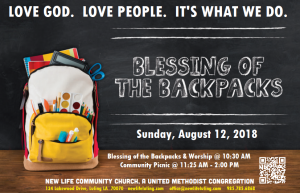 Bring your backpack to our 10:30 AM worship service on Sunday, August 12, 2018 for a special “Blessing of the Backpacks” followed by a fun, free COMMUNITY PICNIC! We’ll have hot dogs, nachos, snow balls, a water slide, and more! Don’t miss the fun! We are also collecting new and gently used belts, which will be donated to students attending local schools. If you’d like to contribute, simply bring your donations to church any time on or before August 12. For more information, call the church office at 985.785.6868 or email office@newlifeluling.com. We can’t wait to see you there!